Mosquito Hill Nature Center - 2 mi east. Local newspaper – County Post East. The Weather Channel – 10 day forecast. The Shamrock Club of Wisconsin – The state affiliate organization of the club. Shamrock Club of Wisconsin, Milwaukee Chapter – Our Shamrock Club friends from Milwaukee. The Shamrock Club of Northeast Wisconsin – Our Shamrock Club friends of Green Bay. The Shamrock Club of LaFayette County – Our Shamrock Club friends pf LaFayette County, WI. The Dane County Shamrock Club – Our Shamrock Club friends from Madison, WI. Shamrock Club of South Central Wisconsin – Shamrock Club friends of the Baraboo/Reedsburg. Greater La Crosse Area Shamrock Club – Our Shamrock Club friends from La Crosse, WI. St. Patrick’s Association – St. Paul, MN – Our Irish friends in Minnesota. Toledo Irish American Club – Our Irish friends in Toledo, Ohio. The Shamrock Club of Columbus – Our Irish friends in Columbus, Ohio. Sioux Falls Irish Club – Our Irish friends in Sioux Fall, South Dakota. Shamrock Club Color Guard Pipes & Drums - Club pipes and drums band from Milwaukee. Tripoli Scottish Highlanders – Pipes and drums band from Milwaukee. Madison Pipes & Drums – From Madison. Formerly called Badger Pipes and Drums. Celtic Nations Pipes & Drums – Pipes and drums band from Milwaukee. Minnesota Police Pipe Band – Pipe and drum corps from Minnesota. Reilly – Our premier band for 2011 & 2014 Irish Fest. Visit them on Facebook. Sheamus Fitzpatrick and the McNally Boys – Our morning band for 2011, 2012 & 2014 & Taft Park concerts in August of 2011 & 2012. StoneRing – Band for 2007 Irish Fest from Madison, Wisconsin. Green Tea - Performed in the afternoon at Irish Fest 2008 & 2012. From Stevens Point. Seven Nations – Our premier Celtic rock band for Irish Fest 2005 and 2009 from Florida. Cashel Dennehy Dancers – Great Irish Dancers that have been in our Parade and Irish Fest tent. O’Dell Irish Dancers – Irish dance Instruction just opened up in Stevens Point. Trinity Irish Dancers – Irish dancers and dance Instruction. Has location in Appleton, WI. Rising Gael – Band with an Irish neo-traditional style for Irish Fest 2008 and 2009 from Madison. And for 2010 our premier afternoon band. Dublin 5 (formerly known as The Rovers) – Afternoon band for 2013. From Annapolis, MD. Switchback – Our morning band for 2010 & 2013. They have been entertaining audiences for 2 decades with their unique American roots music blended with Celtic soul. Off Kilter – Our premier Celtic rock band for Irish Fest 2003 from Disney World in Florida. Gaelic Storm – Our Premier Band for Irish Fest 2002 from California, best known as the steerage band in the movie “Titanic”. Leahy’s Luck – The popular Irish band from Milwaukee that was our premiere afternoon band for 2004 in the Irish Fest Tent. Oshkosh Irish Fest – June in Oshkosh, Wisconsin at the Leach Amphitheater. Milwaukee Irish Fest - August festivities in Milwaukee, WI. Irishfest-La Crosse - August festivities in La Crosse, WI. Milwaukee Saint Patrick’s Day Parade – In March. Madison St. Patrick’s Day Parade – In March. Milwaukee Highland Games – A Scottish festival. Wisconsin Highland Games – Celtic fun with activities, demonstrations, performances, and competitions. Feile Brian Boru – Weeklong events in the summer in Killaloe, County Clare, Ireland. Miramichi Irish Festival - The official Web site of Canada’s Irish Festival held each year in the beautiful city of Miramichi, on the banks of the world famous Miramichi River. StPatricksDay.com – Directory of parades and events. Find parades, Festivals, and more . . .
GoIreland.com - A great source for Travel in Ireland. Killlaloe – Visit Killaloe, Ireland that’s situated on the banks of the River Shannon. Discover Killaloe and Ballina – Guide for the twin towns of Killaloe and Ballina. Virtual Bed and Breakfast Ireland – Here is a neat site to find the perfect Bed & Breakfast anywhere in Ireland on your next trip. Kiltale Holiday Homes – Information for people planning a visit to the heritage town of Trim in County Meath. Welcome to County Clare, Ireland – Places to stay and things to do in County Clare, Ireland. Water Side Self Catering Homes – Places to stay in Doolin and Mountshannon, County Clare, Ireland. Drogheda Tourism – Find lodging, dining, and activities in this historical town in Ireland. Mystic Ireland – Check out this great Irish store in downtown Appleton. Celtic Dance Products – Online store for dancing products from Ireland. Marcy’s Irish Ornaments – An online store based in La Crosse, Wisconsin presents Christmas, wedding, anniversary, coat-of-arms, and baby shower ornaments. Also personalized ornaments. Keltic Nations – Very nice site for Celtic jewelry and other things. They also have a great links page for Irish Organizations and Bagpipe bands throughout the US & the world. Litrioch.com - The largest selection of Irish language books and music available in the world. More than 3000 titles available. The Tinker’s Cart – Imported Irish merchandise and custom clothing and embroidery. Dublin Gift Company – Importer of Irish gifts and the distributor of Irish bread mixes. Irish Tribe – Irish American apparel and various Irish directories by state. The Kilt Sporran Company – Hand made Scottish sporrans and other kilt accessories. liveireland.com – Live internet radio from Dublin, Ireland. surfmusic.de – Find radio stations with internet broadcasts in Ireland or other countries. St. Brendan’s Inn – Authentic Irish food and lodging in Green Bay, WI. 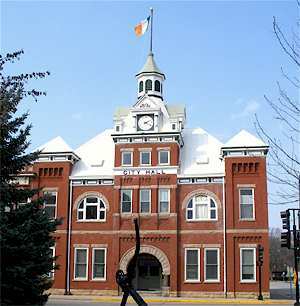 Welcome to the Town of Erin, WI – A great Irish Community near Holy Hill. Irish Genealogy Toolkit – Find your Irish roots and heritage. Irish Abroad – The place to look for all things Irish American. Celtic Wanderings – View beautiful photography of Ireland, England and Scotland. Frank Lennon’s Irish MIDI & Karaokes – Lots of Irish music to listen to or download. Includes original songs, guitar sheets, lyrics, and karaoke files. BlackShade: Irish Definitely!! – Entertaining site with customs and stories for the Irish in all of us. IrishAbroad.com – Connecting the global Irish community. StPatricksDay.com – An online Irish community, free Irish email. travel info, history, and shopping. irish.org – Online Irish community with forum etc. Travel Wisconsin – Wisconsin’s Official Tourism Site. Studio M School of Dance – Located in Hortonville. Mad Dog & Merrill – Nationally recognized ‘grillologists’ based in New London, WI were the 2012 New Dublin St. Patrick’s Day grand parade marshals. Charlies Drive Inn - A great Drive-In with car hops in Hortonville, open in summer. Home of ‘Elvis’. NEW Singles Network – Northeast Wisconsin singles circle of friends. Wisconsin Outdoor – Everything ‘outdoor’ in Wisconsin. Wisconsin – Backwoods Wisconsin Virtual Magazine – The Wisconsin Sportsman’s Website and Magazine.